(1) As America slowly continues to climb out of the Great Recession, more students and families may be earning enough money not to qualify for Pell Grants or need to borrow as much in student loans. Unemployment rates are down sharply since 2010, but median real household income has been nearly flat—so this is probably a minor contributing factor. (2) Americans may be less willing to borrow for college than they were a few years ago, leading to less student loan debt. I’m more concerned about undergraduate students underborrowing for college than overborrowing, particularly as students react to stories about other people’s (atypical) debt loads and concerns about their financial strength. But this is difficult to prove empirically given current data. (3) Part of the decline in total Pell awards is likely due to changes in the FAFSA formula that reduced the number of students automatically receiving the maximum Pell Grant in 2012-13 and beyond. But this would not explain continued declines in Pell dollars received. (4) The most likely explanation to me is decreased enrollment due to an improved labor market inducing some individuals to work instead of attend college combined with the collapse of some of the large for-profit college chains. The most up-to-date data from the National Student Clearinghouse (which is available well ahead of federal estimates) show that enrollment has declined at degree-granting colleges each of the past three years, with the largest declines taking place at community colleges and in the for-profit sector. Lower enrollment, particularly among adult students, leads to fewer students taking out loans and receiving Pell Grants. As the economy continues to slowly strengthen and the for-profit sector continues to sort itself out, I would expect enrollment (and the number of students receiving Pell Grants) to very slowly increase over the next several years. Future trends in student loan debt are less clear. Given the explosion of students enrolling in income-based repayment programs, students (particularly in graduate programs) might have less of an incentive to keep loan amounts in check. Yet, to this point, there doesn’t seem to be a boom in graduate school loans across the board. It would be worth looking at particular colleges with large programs in fields that are especially likely to qualify for Public Service Loan Forgiveness to see if loan amounts there are up by large amounts. For loans it usually takes a number of weeks after the award year ends for all the disbursements to post to that award year. It takes months after that (years in the old ffel program) for award adjustments to occur. The spreadsheet also says, “Data Refresh Schedule: Data will be refreshed each quarter for at least seven prior quarters to account for adjustments. After the adjustment period, the data will be final.” Unfortunately they don’t provide point-in-time 2013-14, 2012-13, etc., data at the same point in the award cycle as they have there for 2014-15 in July 2015. Same-point-in-time would probably be the best way to guesstimate where 2014-15 will end up. Good points. The final numbers may move around a little, but I don’t think ED would release numbers if they thought they would change a lot. 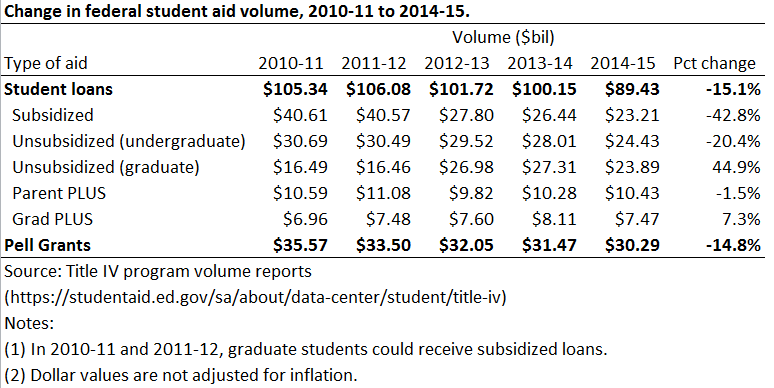 I’m not sure what “summer disbursements” are, but 2014-15 grant volumes seem unlikely to change much. Agreed–and thanks for the additional information! Next Next post: Who Would Use Income Share Agreements to Pay for College?